There’s not a lot one can say about the sixth omnibus collection of Gunslinger Girl without bringing in spoilers, but I am going to try to avoid them. This book is full of ghosts. You know it’s going to be grim by the time you get to page three. Triela, whose self-awareness has always been a critical part of this series, has a couple of truly wonderful moments in conversation with Hilshire. The bumbling Hilshire (along with Petrushka’s Alessandro) has replaced Jose as the center of sanity among the fratelli. The choices that Hilshire and Jose make in this volume might not be the ones you have been expecting. And damn, Alessandro (Petrushka’s fratello) is in full Sherlock mode. In a book that’s been nonstop action for 200 pages, I think it’s a brilliant move to have the climax come in the form of a drawn-out conversation. Triela, Hilshire, Petrushka and Alessandro appear to be different replies to the stories of the characters who find themselves using others as tools. Some embrace that exploitation, some are torn with guilt as they see themselves doing it, some reject the exploitation at first, but then their focus returns to the ends they think justify their means. The action is just a little confused — there are a lot of second-generation cyborgs in the action sequences, so there are a lot of new characters. There’s a lot of young people among the Padanian terrorists, too, so it’s sometimes hard to know who is who, especially when you add the new fratelli to the mix. 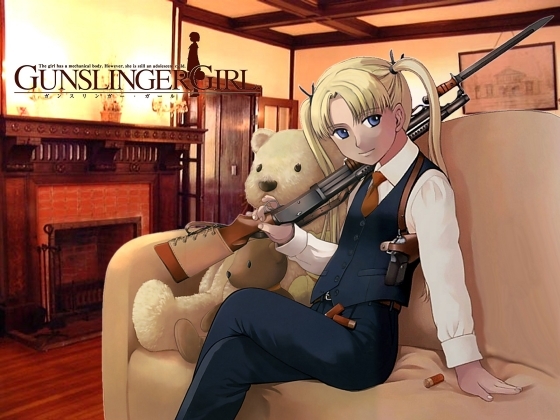 The book has many pages of “the world of Gunslinger Girl” — cultural notes about Italy. Jason Thompson just mused on the topic of manga as travelogue in his column at ANN. It’s easy to see Aria as a tourist brochure, but surprisingly, maybe Gunslinger Girl is one, too. There’s one more volume to go, even though there aren’t many loose ends left (and there are a surprising number of threads brought into play in this volume). I’m wondering if the next volume is going to be a “20 years later” sort of epilogue to the series. The final volume of the series will be released in July. When it is, I expect to re-read the series from beginning to end.